In my opinion no one of any gender can do or say anything to “deserve” physical violence, and the only exception is if you are putting someone else’s safety at risk with violence, necessitating them to respond with violence in self-defense. People are speculating that Solange assaulted Jay Z to protect her sister Beyoncé. However it appears that Solange was not protecting herself nor Beyoncé from immediate physical harm. And it appears that Jay had an effective bodyguard there to protect him from any real physical harm. Therefore, it appears from a (very short, silent) video that neither Solange nor Jay should have been hitting or kicking anybody. 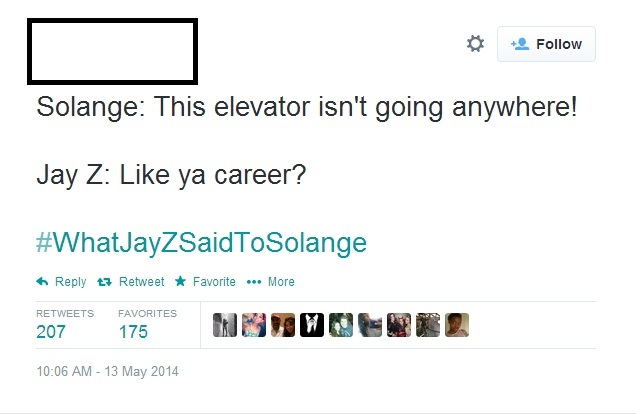 I implore us all to avoid using the #WhatJaySaidToSolange rhetoric as much as we possibly can . It gives credence to the idea that there’s actually something (nonviolent) that someone can do or say, something that could “happen” that justifies physical violence. There is not. Right now, the rhetoric is being used to avoid judgement on the violence Solange enacted upon Jay. Ultimately, the prevailing response to Beylevatorgate helps legitimize the idea that violence can be “caused” by nonviolent words or actions- and that’s no good for women. Well said. It’s difficult to teach young adults, especially teens, that there is no reason for violence when these types of discussions are disseminated so widely and targeting to the young audience. I have not watched the video or TMZ or anything related to what happened. I actually don’t know, but I do know that there will always be people who say things that make you raging mad, but you can’t smack, kick, etc., them.